I love the Aria necklace. It is the perfect length, lightweight and is the type of quiet quality that is instantly noticed no matter where or what I wear it with. This will be an anniversary gift for my wife. Usually I purchase gems; however, this caught my eye. I am sure she will like it. The Aria necklace is a very high quality, finely-crafted piece. It is not too big, not too small. I happened to luck out and purchase it on sale, so the price was right. I traveled to Italy a few years ago and have been kicking myself ever since that I did not purchase gold jewelry while I was in Florence. Now I have a gorgeous necklace! This necklace is very lightweight and a classy piece of jewelry. I love the quality that was put into this elegant piece and expected nothing less from Stauer! The gold in this necklace is absolutely stunning. I do a bit of prospecting on the side and my local jeweler was really taken away with this piece when I brought it in after purchasing it. The design of this necklace really pops out at me. Looking at the weaving in's and out's really catches the eye. 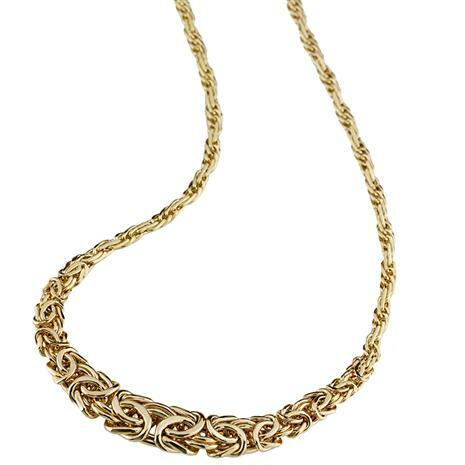 It's different than every gold necklace you look at it. I'm not a very tall person, so something like this feels comfortable around my neck. If you've got the money, spend it on this! While in Milan I was able to attend Verdi's famous opera “La Traviata” that tells the bittersweet love story of a beautiful and wealthy Parisian. The first act opens with a gorgeous aria “Ah, fors’ è lui...Sempre libera” that is a lilting, airy, tribute to live a carefree life. While the sentiment was light the effect of the soprano’s solo was grand and bold. Inspiration hit. I wanted a piece of jewelry that would capture the essence of lightness in a bold performance. So our maestro Daniele tapped into the incredible talents of Italian metalsmiths that specialize in creating the lightest and most delicate precious metals in the world. This took us to the epicenter of precious metal masterpieces— Arezzo. The intricate metalwork seen here is Italian Byzantine design at its best. Made from polished Italian 14K yellow gold, the traditional woven design crescendos slightly at the center for a breathtaking performance. When I saw the exquisite result, one name, and one name only came to mind. Aria, which is Italian for ‘air’ and of course a striking solo musical performance. Our Aria Necklace has mastered its role beautifully. Not only will it draw rave reviews, it won’t weigh heavy on your wallet.